Mr. Enver Masud, an engineering management consultant based in the Washington, D.C. area, specializes in planning, management, regulation and restructuring of the electric power sector. Masud: "California Electricity Deregulation Discards Cost Minimization, Favors Profit Maximization"
Mr. Masud has consulted for the World Bank, EBRD, and USAID in Albania, Czech Republic, Egypt, Ghana, Indonesia, Latvia, Norway, Pakistan, Russia, Tanzania. He has been at the forefront of innovation at U.S. utility and regulatory organizations, and has conducted large, complex studies such as the U.S. National Power Grid Study and National Electric Reliability Study. He has testified in regulatory proceedings, developed models used by the electric utility industry, managed research programs, conducted workshops for senior utility and government personnel, and is the author of more than 120 technical and non-technical articles and reports. 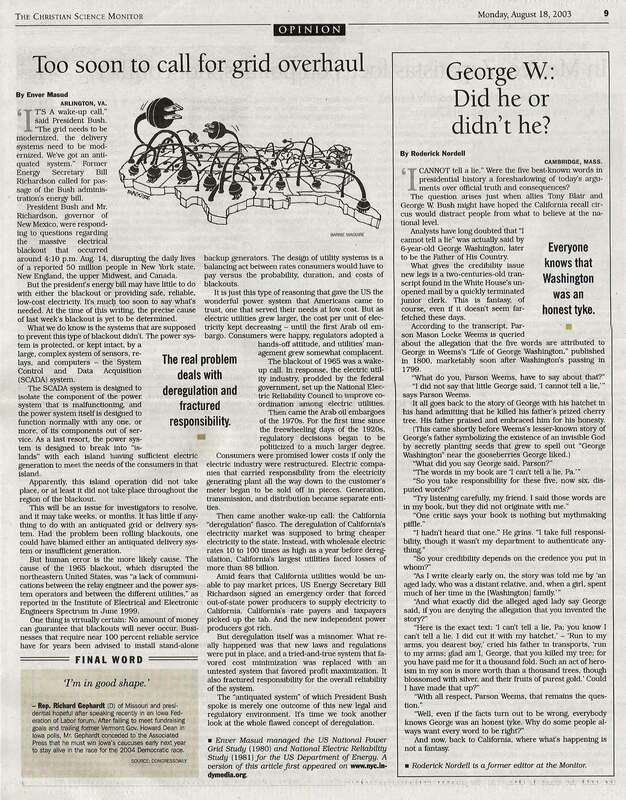 His assessment of the August 14, 2003 blackout appeared as on op-ed in the Christian Science Monitor. His efforts to expose waste in the electricity sector were the subject of an article by Jack Anderson. Mr. Masud registered as a professional engineer. He was Senior Member of the Institute of Electrical and Electronics Engineers, and a member of its System Planning Subcommittee, International Practices Subcommittee, and Long Range Planning Task Force. He was also a member of the NARUC Subcommittee on Electricity, and on the Advisory Panel of the international journal Electric Power Systems Research. He is the founder and CEO of The Wisdom Fund. His formal education includes an M.S. (Management Science, Operations Research, Computer Science), B.S. (Electrical Engineering), B.S. (Physics, Chemistry, Mathematics). Powrplan International * International Resources Group * D.C. Public Service Commission * Iowa State Commerce Commission * U.S. Department of Energy * U.S. Energy R&D Administration * Oklahoma Gas & Electric Co.
Engineering Management Consultant -- Consulting in restructuring, regulation, management, planning of the electric power sector. Indonesia: Served as leader of the Norplan and Coopers & Lybrand team, and principal author/editor, for study of the institutional framework and regulation of the power sector. Funded by the World Bank, this study defined the issues and options for Indonesia, and recommended restructuring the power sector in order to close the supply/demand gap, increase sector efficiency, and facilitate private sector participation. Received quality and profitability bonuses. Russia: Managed the integrated modeling needed to determine the investment requirements, priorities, and cost effective strategies for upgrading nuclear safety in the Russian power system. Resolved objectives, assumptions, schedules with five U.S.-Russian working groups (Burns & Roe, Hagler Bailly, Harza, ICF, Raytheon) which determined the generation, transmission, and energy efficiency options, their costs, and performance characteristics. Pakistan: Served as coordinator of team (including Ebasco, Hunton & Williams) studying privatization of the power system. Tanzania: Evaluated the economics of adding 2 hydro units versus the combustion turbines recommended by Acres International. Conducted workshop on generation planning. Latvia: Trained Latvenergo staff in the use of generation planning models, developed methods for prioritizing distribution and transmission investments, and assisted in development of the company's financial management plan. Albania: Developed the mission, functions, organization chart, and job descriptions for the newly established regulatory authority. Conducted training in least cost planning. Norway, Ghana: Conducted workshop on restructuring, regulation, and privatization. Czech Republic: Conducted workshop for clients from Latvia on engineering economic analysis and investment planning. USA: Advised major U.S. defense firm on electric utility market potential. USA: Advised Maryland People's Counsel on generation planning and bid evaluation. Developed computer model to evaluate private power bids using a mix of subjective and objective criteria. Egypt: Developed master plan for training management and engineering personnel in electric distribution companies. Senior Power Advisor to the Government of Pakistan -- Conducted planning studies and seminars, installed planning models, and trained users. Developed and drafted electric supply plan for Pakistan. Conducted seminars on engineering economics, project management, supply/demand planning, transmission planning. Installed WASP and CYMFLOW generation and transmission planning models and trained users. Director, Office of Engineering -- Managed office responsible for planning and engineering management functions related to the regulation of electric, gas, and telephone utilities. Chaired Data Processing Task Force. Directed studies to determine the potential for conserving electric and gas energy in commercial buildings in Washington, D.C.
Director, Operations Review Division -- Defined, developed, and managed new 29 person regulatory division responsible primarily for audits and evaluation of management, planning, and operations of the 412 electric, gas, and telephone utilities in Iowa. Chaired Electricity Task Force. Directed/participated in preparation of 26 reports of utility audits and investigations. Conducted first state-wide review using EGEAS of utilities' generation expansion plan, and identified excess generating capacity expenses of $125 million annually. Obtained commitment within 67 days to combine electric utilities hourly generation scheduling for savings of over $50 million annually. Developed framework for measuring productivity and service quality of utilities. Acting Chief, Strategic and Emergency Planning Branch -- Defined, developed, and managed programs to improve utility planning, productivity and emergency preparedness. Managed approximately 150 person ad hoc organization to timely and within budget completion of the National Power Grid Study, and received an award for "Superior Job Performance". Managed approximately 50 person ad hoc organization to timely and within budget completion of the National Electric Reliability Study. Developed new model and identified $3 billion annual potential for oil savings. Systems Engineer -- Assessed the state-of-the-art, and directed research programs to develop new or improved models for power system planning. Senior Engineer, Engineer, Construction Inspector, Engineer Trainee -- Conducted planning studies, evaluated division budgets, developed unique transmission and distribution planning models adopted by the Electric Power Research Institute, Westinghouse, utilities. These models mark the first application of optimization techniques for electricity distribution planning.